Please note: NYFA kids camps do not qualify as a prerequisite. In this advanced 3-Week Filmmaking II summer camp for teens, each student gets the opportunity to write, direct, and edit an original short film of four to six minutes in length. Prior to starting the three-week camp, students must provide a short script of three to six pages in length. Scripts can include dialogue, although visual storytelling will be encouraged. This is a necessary requirement as there is no time to write scripts once the program begins. Due to the quick pace of the camp, students must dedicate all their time and energy to their films. Hands-on classes in camera, lighting, sound, directing, and editing give students the opportunity to explore the industry-standard HD cameras they work with and help them prepare for their own projects. Additional camera, sound, lighting, and grip equipment will be introduced that is not a part of NYFA’s introductory camps. These new tools will help students improve both their technical and storytelling skills. In Production Workshop classes, students will shoot camera and lighting tests, as well as a short scene to review the conventions of film coverage. During the third week of the camp, students will go into production. Working in crews of four with an instructor, each student will have one to two production days. When not directing, students rotate in the roles of director of photography, assistant camera, and sound operator. When not in class or shooting film, students will be casting, creating storyboards, and rehearsing. For teens who already have experience with filmmaking and want to advance their skills and experience as a filmmaker, NYFA’s 3-Week Filmmaking II summer camp for teens is the ideal choice. Students should bring a hard drive of 250 GB or larger. 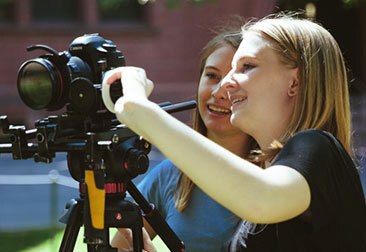 Want to learn more about this 3-Week Filmmaking II Camp? Click here to learn more about the application process.